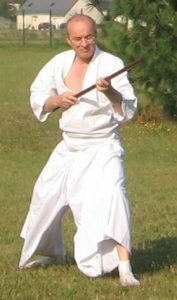 Reaching the Shodan / Jun-shidoin (Graduate) level of a Shintaido curriculum (Bojutsu, Karate, freehand Shintaido, and now, Kenjutsu) means that one now possesses all the elements of action and meaning to deepen its study and its application in the dojo and in various situations of everyday life. To give gorei in Shintaido, means in the strict sense, “to give the tempo of the collective action” (counting aloud) and more broadly “to order the beginning or the stop of the action,” and “to decide the nature of action,” directing the action of a group of people (including oneself) in the course of personal development. If one chooses to study and apply Shintaido while directing such a group, one creates in a certain fashion “squared Shintaido” (Shintaido²) . To make “squared Shintaido” implies that the gorei becomes our means of personal artistic expression and at the same time a privileged space to improve ourselves by ourselves and by and for the group by means of the common language of practice. In such a symbolic and collective space everything makes sense and the limits are the ones we give ourselves. Everything makes sense because the practical space (the dojo), the relational space (the micro-society of the group) and the cultural space (the field of references of the group) are connected in multiple ways, explicit and implicit. The learning of the group occurs only if these different dimensions come into resonance, in coherence. In all of these situations, the responsibility of the goreisha is very significant. Thank you Pierre Sensei for very wise words and philosophy.